Bath’s Abbie Dackin defends New Knoxville’s Erin Scott during Saturday night’s Kewpee Tip Off Classic championship game at Bath High School. Lima Senior’s Cheyanna Bean puts up a shot against Findlay’s Katie Thomas during Saturday night’s Kewpee Tip Off Classic consolation game at Bath High School. BATH TOWNSHIP — Bath wants to push the tempo and force opponents into turnovers. In Saturday’s championship game of the 15th annual Kewpee Tip Off Classic against New Knoxville, Bath forced the Rangers to turn it over. However, the Wildkittens could not convert enough of those turnovers into points, as New Knoxville slipped out with a hard-fought 37-33 victory. With the win, New Knoxville (2-0) claimed its second ever Kewpee Tip Off title. The Rangers’ last Kewpee Tip Off title came in 2012. Bath won the annual event the previous five years. Bath’s defensive pressure caused 18 New Knoxville turnovers Saturday night. However, sub-par shooting made it difficult for Bath to take the game over. The Wildkittens shot just 33 percent from the field, including 3 of 20 shooting behind the 3-point line. Ja’Dasia Hardison had nine points and three steals for Bath (1-1). Ruby Bolon, a 5-foot-11 sophomore forward, added eight points for the Wildkittens. Erin Scott led New Knoxville with 11 points and three steals. New Knoxville shot 41 percent from the floor, including 45-percent shooting on 3-pointers (5 of 11). The first quarter went back and forth before New Knoxville slipped out with a 12-11 advantage. Jacklyn Leffel led New Knoxville, scoring seven points in the first stanza. In the second quarter, neither team could muster a great deal of offense. Heading into the halftime break, the game was tied at 17 apiece. Both squads turned the ball over nine times in the first 16 minutes of action. At the end of three quarters, the game was knotted at 29 apiece. A little more than midway through the fourth quarter, the Rangers pushed out to a 37-33 lead. Scott hit a 3-pointer to extend a one-point lead out to four. New Knoxville held off Bath the rest of the way. The Wildkittens were just 2 of 9 from the field in the final stanza. New Knoxville won the battle on the boards, 29-20. In Friday’s opening round of the Kewpee Tip Off, Lima Senior struggled, offensively, in its 34-33 loss to New Knoxville. 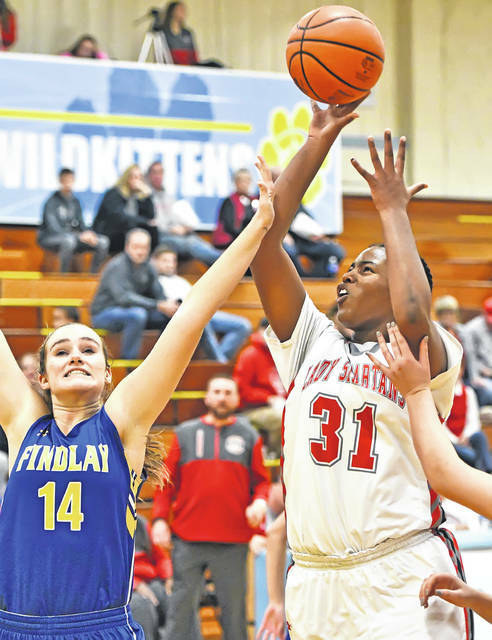 However, in Saturday’s consolation game against Findlay, the Spartans (1-1) got after it defensively and scored in bunches off transition, en route to a 39-point whitewashing of the Trojans. Lima Senior’s defensive pressure wreaked havoc, causing 29 turnovers Saturday night. Lima Senior’s Destiny McDonald led all scorers with 31 points. McDonald also had 11 steals and seven assists. Nakiya Sigman scored 16 points, had six steals and six rebounds. Taylor Washington added 14 points and six boards for the Spartans. 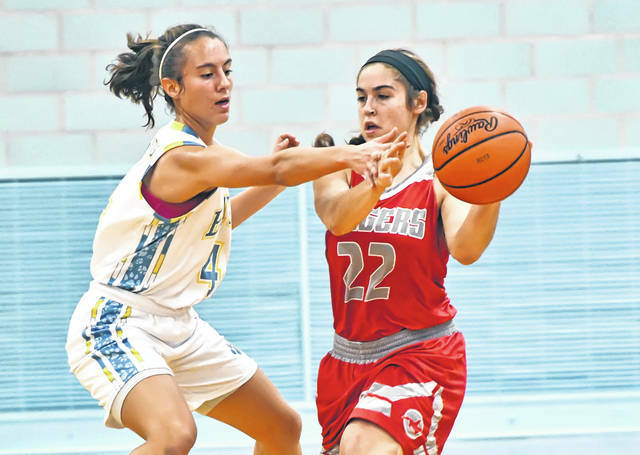 Lima Senior shot 48 percent from the field. Findlay connected on 39 percent of its field goal attempts. Katie Thomas led Findlay (0-2) with 19 points, including five 3-pointers. Lima Senior started Saturday’s game with a 6-0 run. The Spartans extended their lead to 15-5 by the 4:16 mark of the first stanza. Lima Senior’s defensive pressure caused four Findlay turnovers in that short period of time. Lima Senior led 23-13 at the first stop. Findlay turned the ball over eight times in the first eight minutes of action. Lima Senior kept pushing the tempo. The Spartans opened the second quarter with a 9-0 run, pushing its lead to 32-13. Findlay turned the ball over four times in a little more than a minute into the second stanza. Lima Senior pulled away for a commanding 56-21 lead by the halftime break. In the first half, Findlay turned the ball over 21 times. McDonald led Lima Senior in the explosive first half with 17 points and eight steals. The Spartans led 67-39 by the end of the third quarter. “I was really proud at the way we responded tonight,” Halliday said. “After last night, I wasn’t sure what to expect. We jumped out on them early tonight. Reach The Lima News sports department at 567-242-0468.